Carl Frampton will have his pick of the big guns in world boxing after announcing his spilt from Barry McGuigan and Cyclone Promotions yesterday. In a partnership that started out in 2009 - Frampton and McGuigan worked together to make ‘The Jackal’ a two-weight World champion. Rewind just over 12 months and Carl Frampton, Barry McGuigan and coach Shane McGuigan were celebrating defeating Leo Santa Cruz to win the WBA featherweight title in New York. 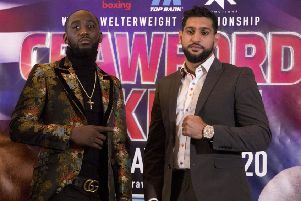 But now they have decided to end their association and Frampton - who will be in Las Vegas this weekend for the Floyd Mayweather jnr versus Conor McGregor clash - will be courted by all the big names of world boxing. Matchroom chief Eddie Hearn has already expressed his interest in resigning Frampton and he will be looking to meet with the Belfast fighter this weekend - as he will also be in Vegas for the McGregor showdown. Recently Hearn had suggested he would want to speak to Frampton if the split rumours were true. “If a split is true, do we want Carl Frampton to be part of Matchroom? Absolutely,” said Hearn. Frampton also looks set to talk to the big American movers and shakers - Al Haymon, Goldenboy and Top Rank this weekend - when he is in the USA and is seems that meetings have been arranged as the 30-year old decides who will see him through to the end of his professional career. There will also be interest from Frank Warren - who has deals with BT Sport and BoxNation - and MTK Global, whose stable includes Paddy Barnes, Lewis Crocker and Steven Ward. But it is a sad end to the Frampton and McGuigan partnership as McGuigan has guided the fighter through his entire career, with ‘The Cyclone’ having promoted the former two-weight world champion’s fights since 2013. The rumours were confirmed yesteday as Frampton released a short statement on Twitter. It said: “I can confirm that I have parted company with Barry McGuigan and Cyclone Promotions. Due to the split it also seems likely that Frampton will leave trainer Shane McGuigan. Adam Booth who trains Belfast World champion Ryan Burnett is in the mix.